By nature the American Pit Bull Terrier (or Pit Bull) is friendly toward humans, which is enhanced by proper training. Socialization of your Pit Bull is of utmost importance. Many people want Pit Bulls for guard dogs, but they are rarely aggressive in the absence of their families. They do function as a deterrent, due to their imposing appearance and people's perceptions of them. Dog lovers who want a partner for athletic activities often find good ones in Pit Bulls. The Pit Bull is a Terrier breed. They are known for being aggressive toward other animals, and, if trained improperly, people. By nature, they are friendly toward humans. Some areas have instituted breed bans against the Pit Bull. The American Pit Bull Terrier is thought to have been bred as a cross between the Bulldog and extinct hunting terriers. Originally bred for fighting purposes, the Pit Bull has also been used in hunting and war. Pit Bulls come in a variety of colors, all of which are acceptable for registration purposes except for merle. Any eye color except blue is acceptable. The head should be wedge-shaped with slight wrinkling on the forehead, and the teeth should have a scissors bite. Male Pit Bulls should weigh 35-65 pounds, and females about 5 pounds lighter. Both sexes should be about 18-22 inches tall measured at the withers. Pit Bulls do well on foods containing beef, poultry, brown rice, and corn. They need a diet high in fiber and low in carbohydrates. Giving your dog essential fatty acids will improve the condition of his skin and coat. A Pit Bull should be brushed regularly, because they are moderate shedders. They only need baths when they are dirty. Some owners have their Pit Bulls' ears clipped, although this practice is not preferred by kennel clubs. Pit Bulls shed moderately, so regular vacuuming is required if they are to be kept inside. Pit Bulls can be kept inside, and they will do well in an apartment as long as they get plenty of opportunity for exercise. They prefer locations with warm weather. They are active and do a lot of jumping when young. Pit Bulls love toys, but they need ones that are extremely durable due to their love of chewing and sometimes rough play. It's also important that their beds and food and water bowls are durable. Pit Bulls generally get along well with people, unless they perceive a threat their family. They tend to be aggressive toward other pets, including dogs. Properly trained Pit Bulls do well with children, although it is not a good idea to leave them alone with kids they are not familiar with. Socialization of your Pit Bull is of utmost importance. Teaching proper behavior around people and other dogs will make your relationship with your Pit Bull much more enjoyable. Pit Bulls can be trained for tracking and agility. They are quick learners at both. Pit Bulls need to go on long walks each day. They love vigorous exercise, and they are great hiking partners. Depending on your dog's temperament, however, it may be best to keep him away from other dogs. 'Pit fit' is a term used to describe the behavior of a Pit Bull that is sprinting about. American Pit Bull Terriers are often confused with American Staffordshire Terriers and Staffordshire Bull Terriers, so it is important to make the distinction when seeking a mate for your dog. All three breeds may be referred to as Pit Bulls. Pit Bulls are usually healthy, but they sometimes develop joint problems including arthritis. Other health problems to look for include hip dysplasia, cataracts, allergies, and heart problems. American Pit Bull Terrier puppies are becoming more difficult to find due to breed bans in an increasing number of localities. They are available from breeders in some areas, with prices averaging around $500. Adult dogs can often be found through rescue operations for $150 or less. I need to find a new loving home for these beautiful puppies. bulldog the looks more like her mother. She is mostly potty pad trained.Contacts if interested(229) 329-7088. I recently adopted a 5 year old male pit bull mix ( I think he's mixed with a lab) he's well behaved and shows manors. I walk out the door first and got him to stop tugging the leash on our walks by simply pulling the leash up instead of back ( thanks to the dog whisper). He's a friendly dog but I feel he may be to friendly. How do I know if he will protect my family if we are in danger? There are also sometimes where I'll give him a tug and and he doesn't respond, I've asked how to change this and people have told me to hit him hard. Is there another way to get this pit to respect and listen without beating him? I don't want him to become vicious I have a 4 year old and I don't need dog to attack. I just need him to respect what I say and protect my family. Are there any other methods ???? Thanx but that really doesn't help much. Does anyone else know what to do ? Many say they have a pitt bull lab mix - and I am not quite sure if I believe there are that many pitt bull lab mixes running around. In any case - you are saying you do not have complete control of the pup - then I would under no circumstances have him around a 4 year old child. Kids play, they make noise, they throw stuff animals for fun, and you do not know what will set the pup off - too many articles with these dogs hurting children. In some cases killing them. They are all friendly - till they are not. They require a strong, knowledgeable consistent trainer with a lot of experience. As Far as protection goes a 'pitbull' or 'pitbull mix' become very attached to their owners. And though they may never show any signs of aggression or protection once your dog has had time to bond to you and your family I can ensure that he will protect you and your child. My dogs have had no training other than basic training (sit, come, stay, heal basic stuff) and I have no doubt in my mind they will protect me and they have proven it time and time again. 'Pitbulls' are naturally protective, but it would be wise to be extremely aware of your dogs body language around other dogs, no matter how friendly he seems with other dogs, some dogs can be fine with 100 dogs then for no reason whatsoever attack the 101st dog. If you don't put your dog in a situation to fail then he can't fail. Example: Pitbulls especially males can be dog aggressive so for obivious reasons my dogs don't go to the dog park. If you don't put your dog into a situation where something bad could happen and cause more people to fear the breed then you should have no problems with your new dog. I'm not saying keep him away from every other dog, i'm just saying it is wise to very slowly introduce your dog to any other dog you'd want them to play with. You need to be very aware of your dogs body language as almost always they give warning signs before they bite/attack. If your dog is pulling you, you should use a head halter. It helps to get the dogs attention and keep him from pulling so much. I used it with my pit bulls. I have been around so many dogs in my life and I am only 13. Right now I have a chihuahua/pit bull mix and she is a devil. I am working with her. Just try to teach her some things like (watch me) and (sit and stay) and she will use them automatically. If you have her do them lots of times each day. You should never hit a dog. If you have had the dog for awhile, it will have a connection with you, and it will protect you in certain situations. Your dog will protect you when it comes time to. My chihuahua/pit bull gets along great with my lab, (both females) and my chihuahua/pit bull helped bring out the puppy part in my 6 year old lab. Pit bulls (no matter the case) will love you no matter what. Even if her old owner beat her, she will look for affection and wag her tail. (and if you have any info on how to get a dog to stop chewing her dog bowl please tell me.) My dog is in her teething stages, she is 9 months. I have been trying to STOP bsl and no one listens to me. When I am with my pit bulls people stop and drag their children to the other side of the road. They say that I will regret having my dogs. They say they will turn on me. I have been all loving to my dogs and they are loving to me as well. I want to STOP BSL FOREVER! I want to be able to walk my dogs down the street like every other person. I want to be able to have my dog with other dogs. And I want others to do the same. STOP BSL FOREVER! I want to make a change in the dogs life and others lives. I want a change in my life as well. My first experience with an American Red Nose Pitt Bull Terrier happened when my son brought home what he called a Red Lab. It was a mistreated 11 month old female. When she moved in, I was very nervous of her. She had a serious problem with mange, and we had to bring her to the vet for several mange baths. She was so beautiful when her hair started to grow bath, but her tail was between her legs quite often when she was near me. I began giving her treats that I shouldn't have, like wieners or a slice of salami. and as wrong as I knew it was, we became friends. She wasn't as nervous of me and I was not as terrified of her. I have had a lot of breeds, but I have never had one of this quality. I used to compare her to the high strung Irish Setter I had years before, and a Dalmation that was more aggressive than Disney ever portrayed them. She was warm and loyal, and when she sat on me, she would push her head so hard against my chest, I thought she was trying to climb inside. She was a bit more protective than I would have liked. When we had visitors come in, she wouldn't bark but she always went and sat at the men's feet, never the woman. Most people found it unsettling, in light of the "bad press" this breed was getting. Everyone warned me Sable was going to bite me or someone else but she never did for years. One cold winter morning, my wife's sister came in for a visit, she had always owned big dogs and didn't respect my dog's situation. Sable had not been out for her morning pee, and she had been inside since early evening the night before since it was so cold. in the turmoil of trying to get out for a pee and a strange person "my wife's sister" falling to her knees and moving to hug the dog. Sable snapped at her and although she did not draw blood, there was a lot of opinions about my dog's "natural traits for the breed". While I was infuriated because they didn't know Sable at all, I had to concede however that keeping a dog that had bitten once, created a liability that I wasn't prepared to accept. When it was time for Sable to go to the vet, I didn't want to be home. My son and brother-in-law took her to the vet and I lost the warmest, most loyal, and intelligent dogs I had ever owned up to that time. I presently own a Zuchon hybrid, her name is Chylo and is the only dog who loves, is loyal and intelligent as Sable was. 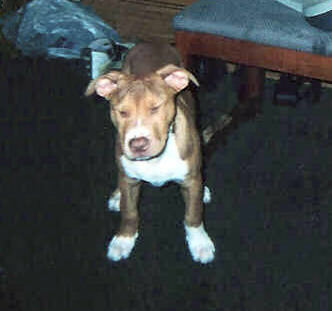 I've missed Sable for the past 15 years, and plan to find another female American Red Nose Pit Bull puppy. I will be more careful to protect her from volatile situations, and look forward to the same love I received from Sable. For the lady who was worried that her Pitt Bull was not warming up to her husband, I expect he is as nervous as she is, tell him to treat her to something she shouldn't have, like maybe a wiener or a slice of salami once in a while, she'll warm up to him and he to her. To one of the other posts about the dog needing a hard slap, I just want to say that animals respond to love with love, respect with respect and aggression with aggression. These beautiful dogs were tortured and killed in dog pits for years and now are being blamed for the mistreatment visited on them by sadistic owners. To all those wanting a big dog for farming, security, friendship and loyalty, don't be afraid of this breed, it will spoil you for any other breed I've encountered.